Great news for 6.35 Hen and Signed 6.35 Hen users, Virtuous Flame has taken his Hen 6.35 PRO release with 6.35 Pro-A, a CFW for Hen or to make things simple: a LCFW (loaded custom firmware… please correct me if that’s wrong). 6.35 Pro-A includes almost have all the features of a custom firmware but you still need to load it everytime you restart your PSP. Still, this makes it a very viable release because it’s compatible with ALL PSP versions. Also, no need to run the Prometheus ISO loader because it runs directly on your XMB. Now if you’re looking for PSX game support, VFlame has also announced that the next version ( 6.35 PRO-B ) will support have this feature and will have a recovery menu. Do note that most of the games incompatible with the Prometheus ISO loader seem to be working with 6.35 Pro-A. 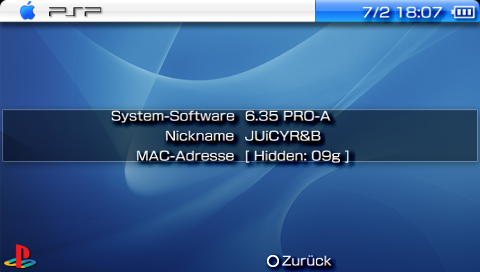 Important Note: If you have PSN games, do not install 6.35 Pro-A. Since it writes files onto flash0, signing PSN games will fail and you won’t be able to run them anymore. Important Note: 6.35 Pro-A1 has integrated the installation of the LCFW and Hen so there’s only two files there now. Run the 6.35 Pro-A1 Updater and follow onscreen prompts. This will install 6.35 Hen and the 6.35 Pro-A LCFW on your PSP. Congratulations, you have installed 6.35 Pro-A. This is what the VSH menu looks like when you press select. Important Note: If your PSP gets turned off, you only need to run 6.35FastRecovery again. With VSH MENU, you can view or change system settings, etc. If you’re not on 6.35 OFW, follow this guide on how to upgrade your PSP to 6.35 so you can install 6.35 Pro-A: HowTo: Upgrade your PSP to 6.35 OFW. If you have comments or questions above the 6.35 Pro-A, please use the comment area. so… this means that 6.35 is better than 6.20 now? meaning? does dreamy theater not work on 6.35? Not in that sense. I had problems loading the app for Dreamy Theater when I had the OpenIdea plugin loaded. I think it’s because it’s trying to decrypt the app upon launch (which it fails). 6.35 Pro-A, since it uses the XMB to load apps, may have the same effect. I will update in a bit too but I will wait for more optios to downgrade :). can i run my iso games on the xmb using this ?????? Yep. That’s basically how it is. does this work for any PSP at all? where do i put the satelite_src folder? Just updated the instructions. I completely forgot about the satelite_Src folder which is why the complete pack doesn’t load ISOs :/ Anyway just put the satelite_Src folder on the root of your memory stick. i follow the instructions said above..help me pls..
currently updating the installation files. but will it work on my psp 3003? is there a specific requirement for it to not brick your psp? so im basically screwed if my psp suddenly bricks up? theres no way for it to get back to normal? and if this worked once..would it still brick if ire-activate it again after i switched it off? Yep. Once it’s bricked, it’s as good as paper weight. sir i got a problem with my psp3003 v6.35..
it works perfectly fine with me… after i shut down my psp i used recovery menu to load the pro-a instantly… so everytime you load the lcfw there’s a chance of brick? Nope, just on the installation. How’s your game compatibility thus far? do you know a way to make it work? I changed my iso mode to m33 driver still it doesn’t work. i format my memory stick…. i restore factory default of my psp..
i think it will be better to downgrade my psp to 6.20 for now… and wait for the TN-D…..
can you please tell me if n64 emulator and picdrive emulator , and how can i use plugins on my psp go , like psn lover ?? is it safe? how can i use plugins , like cxmb and psnlover , please can you tell me how ? and does the plugins works for psp go , and cxmb does it work ? how to put plugins and activate? Ohh update for 6.35 PRO-A has been released.. will be updating the links. There’s an update to 6.35 Pro-A. what’s new? also, I just saw in the post that 6.20 TN-C HEN has been updated too? There’s a separate branch of the CXMB plugin for 6.35 Pro-A by TOcean. if you don’t have a seplugins/vsh.txt simply copy what’s provided in the zip file. hey i got 6.35 pro a the newest is there pro b or something? Updated links to 6.35 Pro-A1. 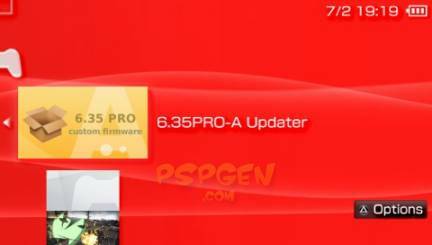 If you have 6.35 Pro-A and want to upgrade to 6.35 Pro-A1 just download the new updater and copy the extracted PSP folder directly on to your memory stick or the PSP Go‘s storage and run the right installer. do you know what is the problem of my psp. ??? thanks syl… you cleared my mind…. Heh, that’s funny, because my Sandisk 8GB does the same thing. I think it’s just the memory stick. if ur on 620 and want to go up to 635 A1, when u get up to 635, do u have to instal the first version, pro A first, or just install the pro A1 update ? do i still need the fast recovery even if i’m now on pro-A1? Not really but it’s much faster to use the fast recovery that run the whole installer again when you turn off your PSP. and it works well, except some games I’d like to play, like Valkyrie Profile: Lenneth and Silent Hill: shattered memories won’t work. Could this thing help me, and make those games maybe work, or should I stay on that other? the opens 52 of memory statement, is that a setting or just there automaticly in pro A1 and nothing u have to do to have it? hey dude everything works right i upgraded to 6.35 pro a1 and even the cxmb and psnlover plugins work but i have one question how can i convert ctf themes to work ? im afraid to use my m33 themes is there a converter or something ? i know a converter but im afraid to use it can someone confirm that converting 5.50 and 5.0 themes to this 6.35 proa1 will not brick or do anything to psp? IT WORKS ON INTERNAL NOW YAY! SYL i read this over the net…. i hope this is true… is their a way to fix bricked psp ???? Put down a clean cloth. Place the PSP face up on the clean cloth. Open the battery compartment and remove the battery. Put the battery aside. Pick up a Memory Stick PRO that has the “Magic Memory Stick” software loaded. Open the memory slot cover and insert the Memory Stick PRO into the PSP’s memory slot. Close the memory slot cover. Pick up a Pandora battery and insert it into the PSP’s battery slot. Put the battery compartment back in place over the battery and turn the PSP face up on the clean cloth. Wait as the PSP turns itself on and presents a selection screen. Use the D-Pad to select the setting for the PSP to reboot itself with firmware 4.21. Press the “X” button to make the selection go into effect. Wait as the firmware formats the PSP and installs itself into the PSP’s operating system. Use the D-Pad to select the setting for the PSP to shut itself down. Press the “X” button to make the selection go into effect. Wait as the PSP shuts itself down. Turn the PSP face down on the clean cloth. Remove the battery compartment and take out the Pandora battery and replace it with the original battery that came with the PSP. Replace the battery compartment. Remove the memory stick. Turn the PSP face up on the clean cloth. Hold down the power button to reset the PSP and bring up the setting to reset the Flash memory of the PSP using the DPad and pressing the “X” button to make the setting go into effect. Wait as the PSP reboots itself. Press the “X” button to indicate agreement with the PSP license. Wait as the PSP goes to the Home screen. This looks like a guide for older PSP models using the Pandora Battery. . Current ones (the PSP-3000 and the PSP Go) are simply too secured to be unbricked. that is the way how to fix bricked psp… how can i get pandora battery… and magic memory stick software ??? 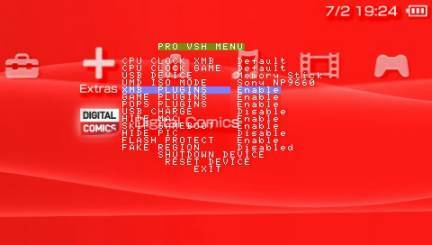 i was just wondering what this `Flash Protect` option in the VSH menu is for, does it really protect from accessing my flash, thus preventing bricking of the PSP? thanks..
wasn’t sure enough to enable it, too scared that maybe it would brick my PSP3000,,,thanks! Yep, it prevents stuff from being saved onto places that’ll brick your PSP. thanks for the quick reply, i better enable it now. thanks again! WHERE TO BUY PANDORA BATTERY… AND WHERE CAN I FIND MAGIC MEMORY STICK ??? For cfw’ed phats, do you need to un-cfw it to 6.35 to get A1 on there? If you have a Pandora Battery, just enter recovery mode and install the ofw you want. If you’re on 6.35 Pro-A1, you need to run the remove cfw files, rerun 6.35 Hen then run Hellcat’s Recovery Flasher to install the ofw you want. Thanks, it was a succes!, but i got a question, if, for example, i put a new memory stick in my psp, and turn it off, will i lose the instalation? or is just enough copying the Fast Recovery on the new memory stick and running it? do i have to perform the complete instalation process? I would also advice you to copy the installer to your new memory stick, just in case. Hello and thanks, but, could you tell me how to play psx games on my psp? i’ve been searching for a pops working on this hen, but no luck, could u? pls. Hm I am currently using a PSP 2001 that came with the Daxter bundle. For my homebrew and iso’s I use 6.35 PRO HEN and iso tool v1.960. Should I upgrade to this? Will it damage my psp? Hey Sly i have a question. once i load up all this stuff in my psp go is there a way to return the psp back to normal some day? i have a lot of games from psn and i was wondering if i can never play them again after doing this? Some PSN games require that your PSP be free of any unofficial modification to flash0. If you want to go back to 6.35 OFW, 6.35 Pro-A1 and above have an option to uninstall it. is there any snes emulator that works with 6.35 PRO-A4? ano po mas maganda gamitin? yung 6.35 PRO A1 or PRO A4 or yung PRO B? is it true? have thy already fixed it? frm which pack? Nope, the scanlines are at a hardware level for the PSP-3000. However they’re only visible if you look at the screen closely. If they bother you, then the PSP Go is an option. Yes it uses the same screen technology as the PSP-3000 but the smaller screen size means it’s less visible. hi tnx for ur support, but i cnt dl any thing from here! i problem with the uploading, whould u mind to upload in somewhere like rapidshare? or dipositfile.com? sure.. I’ll reupload it to a mirror once I get back from work. well, i got the 6.35 pro-B Updater for my PSP 3004 version 6.35…and lyk i said, the game starts, then the screen goes blank and the PSP shuts down….plz help me. Are any other games giving you this problem? Is F1 Grand Prix in CSO or ISO format?